One of the most controversial figures of Slovak wartime history remains Jozef Tiso. To this day the president of the first distinctly Slovak state often comes in for both praise and criticism. He brought Slovaks statehood, but at the bitter price of allegiance to Nazi Germany. But both Tiso's defenders and critics often forget that Tiso was not the decisive element in creating a new state. "This state was a by product of splitting Czechoslovakia by Nazi Germany. It is of course obvious that after its split in March 1939 the establishment of the Slovak State started to be celebrated. The history of any state is subject to legends and this is one of them. The reality was that this state was created because of the will of Germany and Hitler." The role of Jozef Tiso in the establishment of the Slovak State was secondary although not marginal. After declaring autonomy in October 1938, Slovak political parties formed their own government. The representative of the radical nationalist wing of the Hlika People's Party Jozef Tiso became its leader. Germans used the separatist tendencies of minor parties in the Slovak parliament and succeeded in tearing apart the pre-war Czechoslovakia. 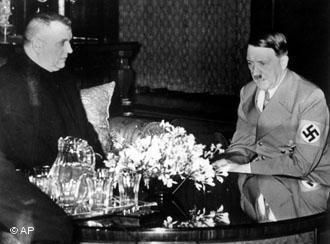 Josef Tiso and Adolf Hitler "Thus on March 13, Jozef Tiso accepted Hitler's invitation. This was after Tiso resigned from the post of the premier of the autonomous government. Hitler told his guest about his plan to occupy Czechoslovakia. He however told Tiso that Slovakia was not in his interest. He left Slovakia to its own fate." At that time, Slovakia was highly in the interest of two of its neighbours - Hungary and Poland. At their meeting in Germany, Hitler promised Tiso to protect the borders in any case Slovakia separated from the Czechs the very next day, March 14, 1939. "Hitler needed to show the rest of Europe that Czechoslovakia was destroyed from the inside. There were some minor separatist tendencies in Slovakia but the major parties represented at that time also by Jozef Tiso thought about the gradual development of Slovakia leading to independence. However, they were forced to face Hitler's challenge." What would other politicians do? "Jozef Tiso speaking about the importance of the establishment of the Slovak State." Jozef Tiso was born in 1887. He became a member of the Hlinka People's Party in 1920's. His political career includes being an MP, a minister, premier and president of a quasi independent state. However, according to historian Ivan Kamenec, Tiso lead an authoritarian, non-democratic state with only one political party in the parliament. Despite this fact, there are still many elderly Slovaks praising the wealth in which they lived during the WWII. Exile historians talk about Jozef Tiso as the saviour of the Slovak nation. "It is doubtful that one man can save a nation. The Czech lands were occupied, Poland was occupied with huge numbers of locals killed and more than 6 million Jews were murdered in concentration camps. However, none of these nations has been exterminated. As a historian I don't like to hear that somebody has saved the nation. A person can bring an alternative of how to solve some problem. But Tiso and his colleagues came with an alternative that would not have lead to salvation." After the WWII, there were historical documents found at the German embassy in Bratislava talking about the Germanisation of local citizens. Those who would not be able to become new Germans were to be deported to Siberia. Neither Tiso and his colleagues or the Slovak public knew at the time about these plans. However, they knew about Hitler's attitude towards Slavs as a subordinated race declared in the book Mein Kampf. It might be seen as naive to think we were the exception. "It really is true that the economic and social situation of that state was relatively stabilized. Germans formulated Slovakia as the "muster" or model state. It was the flagship for the rest of eastern Europe to see how good a life they would live when they become Germany allies. However, Germans exploited the state which was in debt." Another aspect of the Slovak state was its antisemitism. The solution of the so called "Jewish question" had not started by deportations in 1942. Jews were gradually deprived of their rights also in Slovakia. The historical fact is that Slovakia was the only state which organized its own deportations itself. For each Jew, the government paid 500 reich marks to Germany for their deportation. Everything was okayed by Jozef Tiso as the president of the state. There were some exceptions signed by him. "The exceptions granted by the president were given to converted Jews who at the same time had a so called economic exception. Against whom did the president protect them? Until 1944, there was no German soldier on the territory of this country." At the end of the separation process from society, the country deported almost 60 000 Jewish citizens into concentration camps. It was a third of the Jewish population of the then Slovakia. Despite this, president and Catholic priest Jozef Tiso did not initiate the deportations of Jews, but he appeared publicly to approve this step. "There is no single document known where he would have doubted what was done to the Jewish minority. This is the tragedy of society but also of Tiso himself." Priests were highly appreciated in Slovakia. Since the 18th century, they had done a lot for the nation. "Tiso was also a great authority during the Slovak State not because of the fact that he was a politician but due to his priesthood. In his public speeches he used to repeat that what was done to the Jews was completely justified from the Christian point of view." These expressions caused great protests from the Vatican as well as from some Slovak priests themselves. Historical facts underline the responsibility of Jozef Tiso for the fate of 60 000 Slovak citizens during the WWII. "When discussing the deeds of political leaders it is not possible to say:"yes, his intentions were good but he failed to fulfill them." There is the responsibility for tragedy to others. And so the efforts to hallow Tiso are out of order. He was the one responsible. There's no point creating a myth about him." Jozef Tiso was tried by a national court and sentenced to death in a predominantly politically biased process. 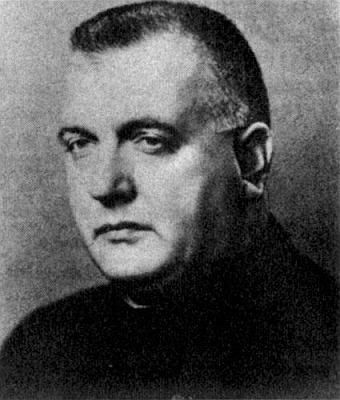 After his appeal for mercy had been rejected by the government and the president of Czechoslovakia, he was executed on April 18, 1947. The ambition of Jozef Tiso was to become a saint. His death was one of a martyr. However, his acts will cast a shadow on the war history of the Slovak Republic forever.